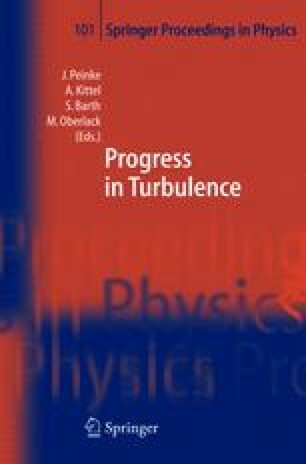 The understanding of the complex statistics of fully developed turbulence in detail is still an open problem. One of the central points is to understand intermittency, i.e. to find exceptionally strong fluctuations on small scales. In the last years, the intermittency in different directions has attracted considerable interest. It has been controversial whether there are significant differences in intermittency between the different directions. More specifically one looks at the statistics of increments [u(x + r) − u(x)] e, i.e. at the projection of the differences between two velocities separated by the vector r in a certain direction e. Here we denotes longitudinal increments with u, for which r and e are parallel and transverse increments with v for which r is perpendicular to e.
In a first step, one commonly investigates the statistics with the moments of the increments, the so-called structure functions, and assumes that, according to Kolmogorov, the structure functions obey a scaling law <un> ∝ rξn at least for sufficient high Reynolds number. The intermittency problem is then expressed by the deviation of the exponent ξ n from the value n/3, the well-known Kolmogorov (1941) scaling.